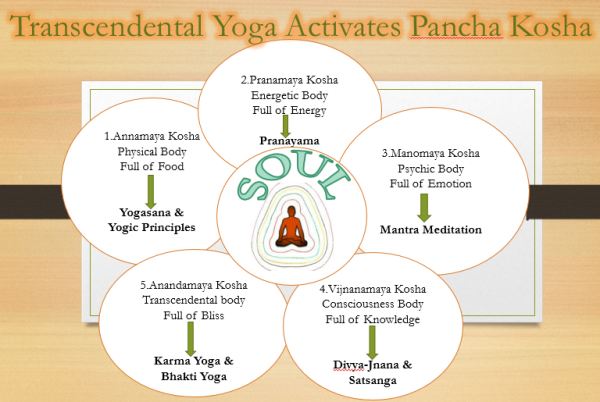 Activate your panchakosha now and experience the real bliss!!! What should be our real business? 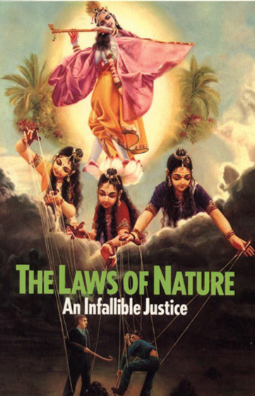 Laws of Nature explores old-aged mysteries surrounding karma & reincarnation, free will & destiny, enlightenment and liberation. 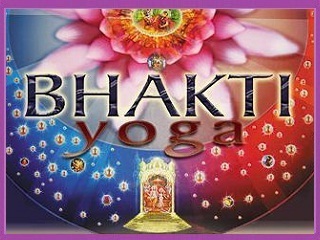 Transcendental Yoga helps you to reach perfection in yoga. 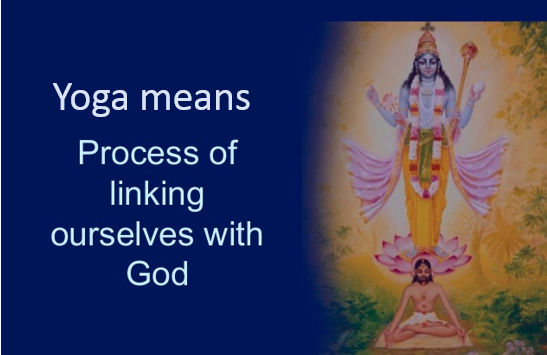 Lord Kṛṣṇa, the Supreme Personality of Godhead, speaks about the topmost system of yoga in the Hata Yoga system. Kṛṣṇa, the supreme authority, recommended the eightfold yoga system. The Vedānta-sūtra says, "This human form of life is meant for searching out the spirit, the Absolute Truth." 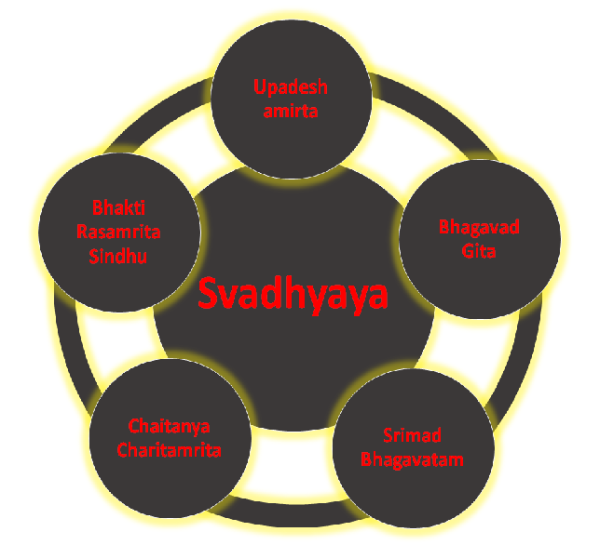 The yoga system is used to search out the spiritual principles within this material world. 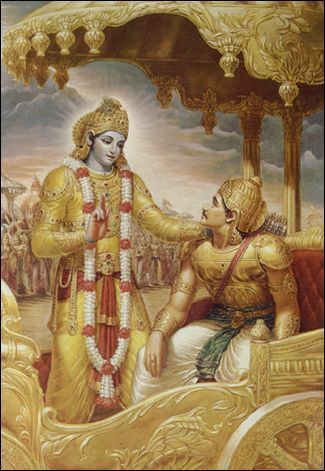 That process for searching is recommended in Bhagavad-gītā by Kṛṣṇa Himself. 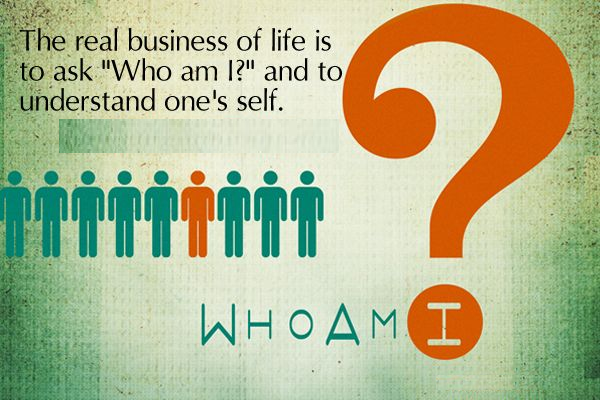 We have different stages of our life—the bodily concept of life, the mental concept of life, the intellectual concept of life, and the spiritual concept of life. 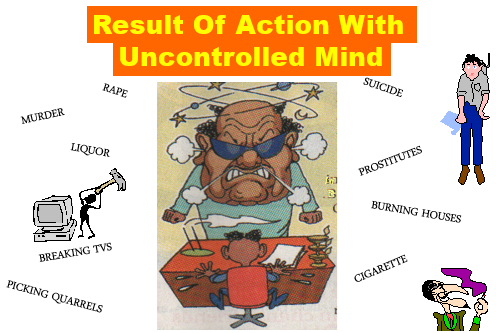 Actually we are concerned with the spiritual concept. As soon as you come to this point of being firmly convinced that you are not this body, that is called the brahma-bhūta stage of Brahman realization. That is knowledge, real knowledge. Advancement of knowledge for eating, sleeping, defending and mating is animal knowledge. Therefore, scripture says that human life is not meant only for these four principles of life, bodily demands. There is another thing—a human being should be inquisitive to learn what is Absolute Truth. That education is lacking. By following the system of yoga one can become joyful. 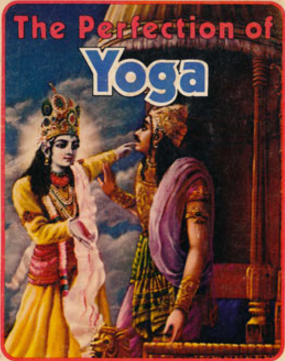 Lord Kapila, the Personality of Godhead, who is the highest authority on yoga, explains the yoga system known as aṣṭāṅga-yoga, which comprises eight different practices, namely yama, niyama, āsana, prāṇāyāma, pratyāhāra, dhāraṇā, dhyāna and samādhi. 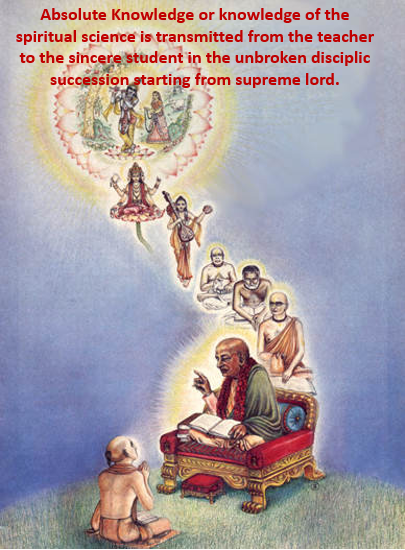 By all these stages of practice, one must realize Lord Viṣṇu, who is the target of all yoga. The Transcendental Yoga helps one to activates the physical, energetic, mental, intellectual and transcendental body by engaging the senses and the mind in the transcendental activities; thereby one enters into the ever-increasing ocean of transcendental bliss. 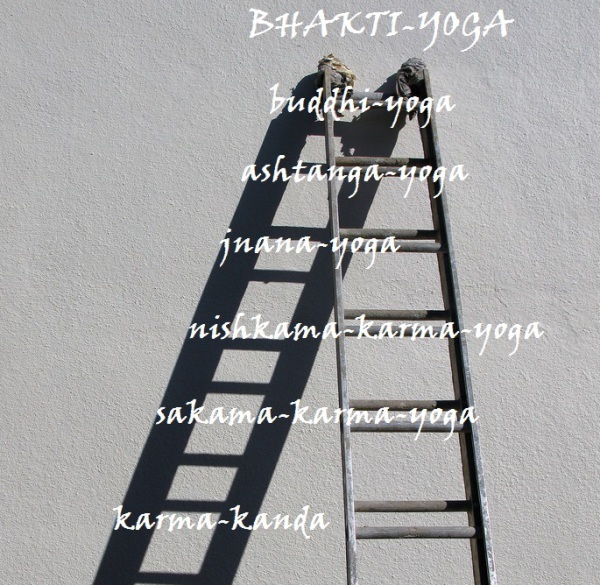 ​First one is annamaya kosha or physical body is activated through Yogasanas and by following yogic principles. 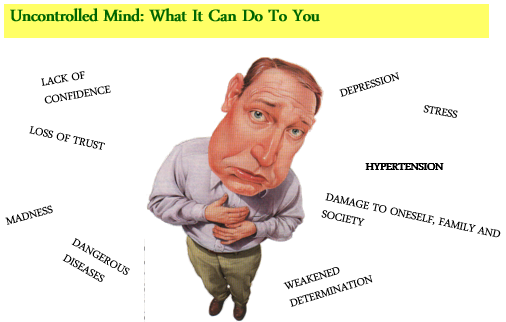 By doing this, the body will be free from diseases and feel the happiness on the bodily platform. 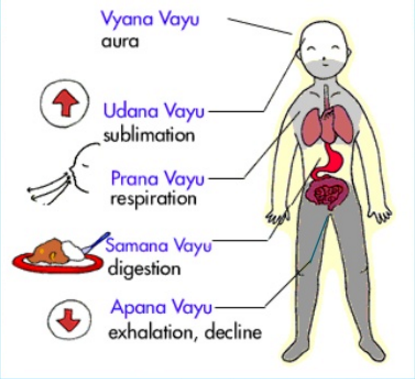 Second one is Pranamaya Kosha or Energetic Body which will be activated through Pranayama. The person will get vital energy from this. 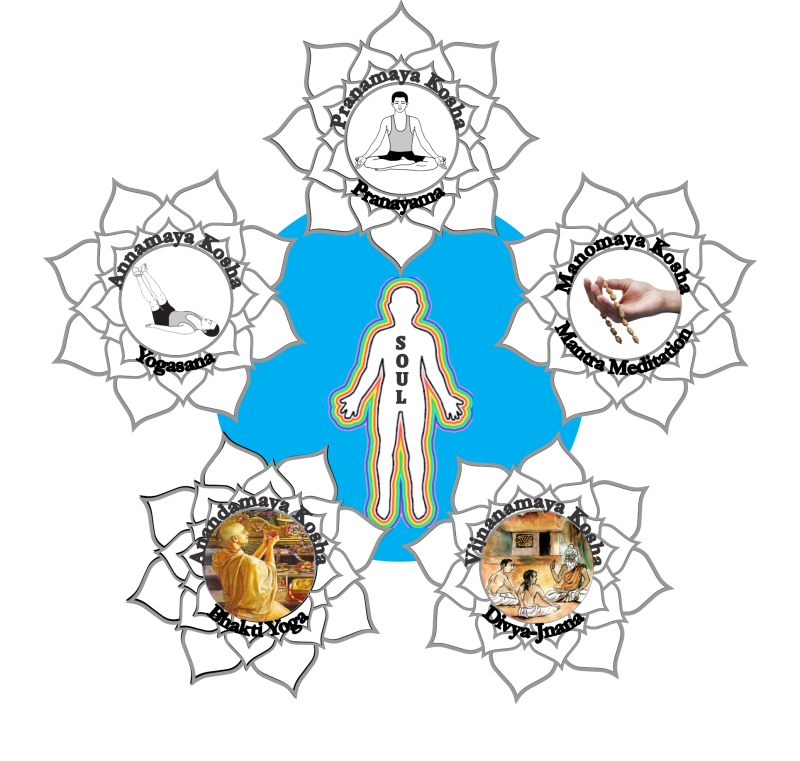 Third one is Manomaya Kosha or Psychic Body which is activated through Mahamantra Meditation. 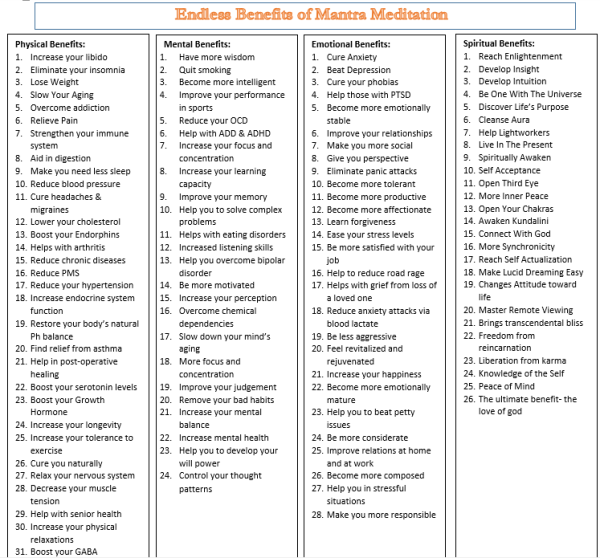 The person will experience the stress/anxiety/depression free life with this meditation. 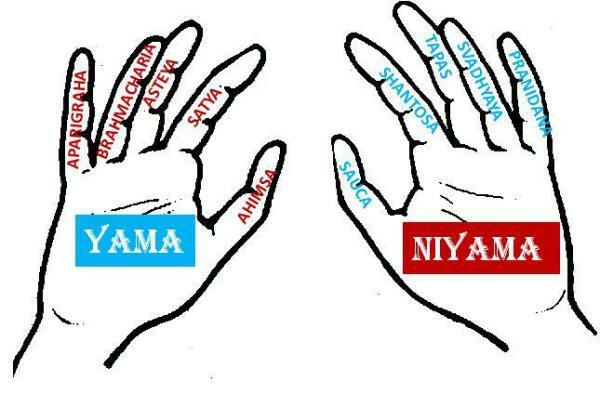 Fourthly, Vijnanamaya Kosha or Consciousness Body which is activated through Divya-Jnana and Satsanga. 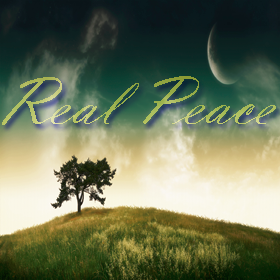 With this, One will get the real knowledge about not only of this world but also of the spiritual world. And Finally, Anandamaya Kosha or Transcendental Body which is activated through the application of Bhakti Yoga principles. 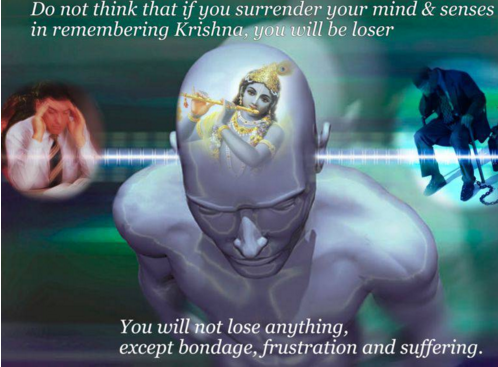 One will experience the unlimited ever-increasing transcendental bliss by obtaining which he will never go back again to the lower level of happiness(refer Bhagavad Gita chapter 2 Text 59 "Param drstva nivartate"). Take your practice to the next level with step-by-step instructions to learn challenging poses through intermediate yoga classes. The advanced yoga poses require tremendous strength and flexibility. Learn how to enter each pose safety and effectively. Gentle yoga class is perfect for beginners, seniors or just those of you coming back to Yoga or looking for a gentle practice. Kids Yoga Classes are unique yoga classes that develop children's mental, physical and emotional wellness. It's fun and great for balance, strength and confidence. It's a vigorous, fitness-based approach to vinyasa-style of astanga yoga, that helps one to build internal heat, increase stamina, strength and flexibility, as well as stress reduction. Its a tailor made yoga poses that will tone your arms, flatten your belly, and slim down your legs. 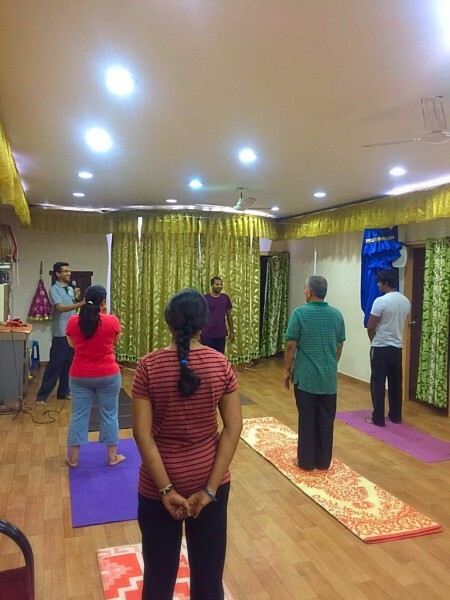 We provide yoga classes in the workplace to reduce stress and increase energy as part of Corporate wellness program. Prenatal yoga poses help mothers to prepare for labor and stay fit during pregnancy. Its a combination of restorative and gentle yoga poses that are specifically designed to those recovering from injury or illness. 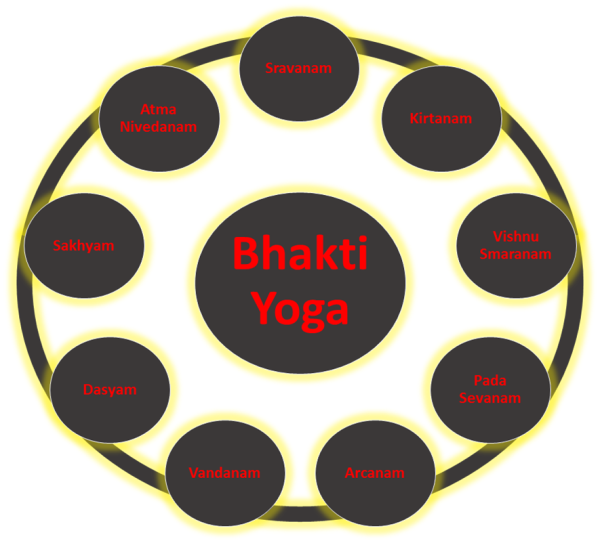 The restorative yoga poses will relax and calm your entire body and mind.It is an excellent opportunity to disconnect from the frenetic activity of daily life. 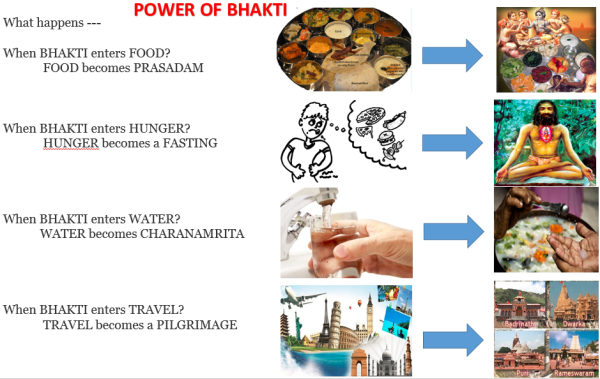 Learn various spiritual practices that reunites the bhakta and God. 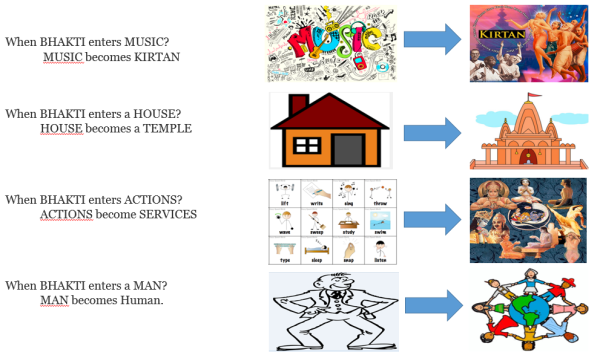 Its a direct, simple and ultimate path of spiritual enlightenment.